In the Florida Keys, a place I love, you appreciate the fragility of nature and the vulnerability of the world we know. The land there is practically flat, and if you turn left or right, you see open water. Any rise in sea level would swallow the whole chain. But if you stop and read the soil, you know you're standing on the fossil of a dead reef. 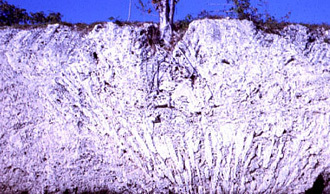 Sometimes, as above, in a road cut in Key Largo, you can see whole huge coral skeletons still standing in place. Only 120,000 or so years ago, this was a thriving undersea oasis. Then the sea level dropped as the climate cooled and the ice advanced, and this precious ecosystem died a terrible, desiccating death. Everything in the middle Keys, from the restaurant parking lot gravel to the 1935 Hurricane memorial in Islamorada, is built from the rubble of an ecological catastrophe. The earth is delicate, but it endures. Nature is cruel, but man is part of nature. Man is not the only destructive force on the planet. I saw a photo like the one above on the AP news wire a couple years back (sorry; I can't find the original anymore), showing a glaciologist and a botanist "examining deposits of ancient alpaca moss recently exposed by the retreat of the Quelccaya ice cap in the Peruvian Andes." Rapidly melting glaciers in the Andes in Peru have uncovered moss and grasses that have been covered by ice since they first grew about 6,500 years ago, said the Ohio State researcher who has predicted global warming will erase mountain ice caps that are a valued water source for many communities around the world. That would be a catastrophe. And that prediction continues to twist the cranks of climate-change cassandras. But think about it (like the AP didn't). That hunk of moss was growing there 6,500 years ago. That's about 6,490 years before the first SUV. Climate then in that place was warmer than it is now (no moss grows there today). That doesn't mean we can stop thinking about the role of man-made factors in the Earth's shifting climate. It means we can start thinking about them. Without the passion and the politics. Yes, the world seems to be getting warmer in recent decades. What does that mean? Is human activity the only reason? What if it turns out that CO2 pollution from cars and lawnmowers is heating up the planet, but that, say, farming is heating it up ten times more? Go ahead and monkey with the world's economies to reduce carbon emissions, but realize that a single major (unpredictable) volcanic eruption could crank back the global thermostat 5 degrees or more overnight. As happened in 1783 or 1816. Make it a more serious eruption -- like an acne rash of volcanoes, but within the realm of the possible -- and you literally could wipe out all life on earth. Long before climate change became a polemical pet of Al Gore, it was a matter of historical scholarship. Since I concentrated my college studies on northern Europe in the Middle Ages, I read years ago about droughts that drove the great horde migrations out of central Asia, the summer of rain that caused the famine of 1215 in England, and the punishing storms that re-drew the coastlines of Flanders, Holland and Friesland in the 13th century. All because of climate change. The North Sea incursions were catastrophic on a Hollywood scale: sea surges punched through the dunes (you can see the relics of the old coast in the line of islands off the west coast of Holland, Germany, and Denmark), killed perhaps 100,000 people, and turned vast agricultural districts into reed seas. In 1231, the sea flooded up river channels into the inland lake of Holland and by 1300 it had become a bay. In 1287, thirty villages in the lower Ems basin were drowned and the Dollart formed. In floods in 1240 and January 1362, sixty parishes in the diocese of Schleswig were overwhelmed, amounting to half the agricultural land of the realm, and perhaps 30,000 people died. The 1362 stormflood was the Grote Mandrenke, the "Great Drowning." The island of Heligoland was 60 kilometers across in C.E. 800; by 1325 it was only 25 kilometers in diameter at the widest, half the loss having come in a single storm in January of that year. Today it is only 1.5 kilometers at the widest. The English ports of Ravenspur and Dunwich drowned about the same time. 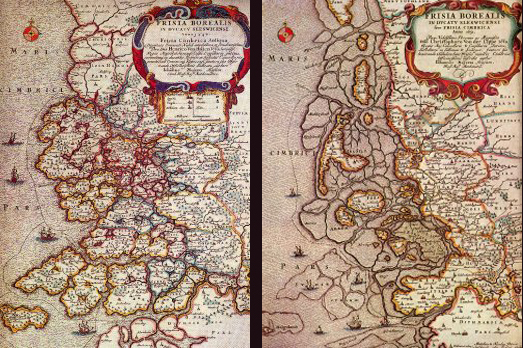 Two 17th century maps of Schleswig, the one on the left showing the coast and lands as they were c.1240, compiled from parish records and reliable local information, the other showing the contemporary view and the outline of the drowned lands. Heligoland is the island at lower left in both maps. And all that was before the internal combustion engine, the Frigidaire, the Industrial Revolution. The Earth's climate changes over time. The change can be catastrophic. Some scientists and some historians always have been aware of this, but most people aren't, because the temperatures in the last 500 years have been remarkably stable. The Europeans of the Middle Ages saw the last dramatic phase of warming and cooling, but even that was a blip compared to what can happen. We still don't know what makes it change; probably a combination of processes including everything from volcanic eruptions to deep sea currents to, possibly, interstellar dust. What we know for sure is the Earth has been much warmer in its recent past, and much cooler. There's no guarantee on the climate you see around you. We ought to pay more attention to this. The discussion we ought to be having about climate change would take into account both human agency and other, potentially much more serious, forces. Even if we know for sure we're having an impact on the climate, that doesn't answer the question of how that impact flows into the ongoing changes that will occur with or without us. But instead, the debate has shrunk into a chirping contest between name-calling factions: "eco-freaks" and "tree-huggers" vs. "fossil fuelers" and "corporations." I wish the people who expect me to join this religion would take the time to make it palatable to common sense and to admit that intelligent people of good will might not be convinced by their doomsday movies. Explain, don't hector. And acknowledge for a change that the environment confronts us with complicated choices; we're hooked into an energy system that fuels a prosperity unrivaled in human history; that prosperity keeps poverty, disease, and starvation at bay. The seers of the 1960s predicted India and China would collapse into overpopulation chaos, and drag the world with them, but instead they have grown toward stability and even affluence, and their consumption of fossil fuel has grown dramatically at the same time. That's not a coincidence. Yet to Peter Matthiessen, to quote one environmental zealot, the current energy system is nothing but a plot by the "hardened apostles of material progress," and a shadowy cabal of "fossil fuelers." Ross Gelbspan decries "greenhouse skeptics" as "criminals against humanity." Start the discussion by acknowledging that the Earth's climate fluctuates, and that's just nature's way. On the Alaskan North Slope, where Matthiessen frets about how much snow falls on the musk oxen, three-ton duck-billed dinosaurs once grazed in herds year-round on lush river-valley vegetation. 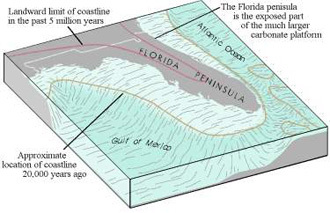 Go thumb through a paleoclimatology textbook (or find something like one online). Look at the charts and graphs. Here's one that a climate-change alarmist will love. 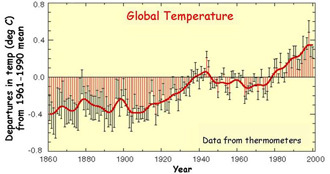 This is the average global temperature from 1860 to 2000. Runaway global warming for sure. Now take 100 steps back. 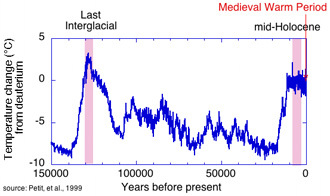 Over on the left you can see the temperature rising up out of the depths of the last Ice Age, about 12,000 years ago. 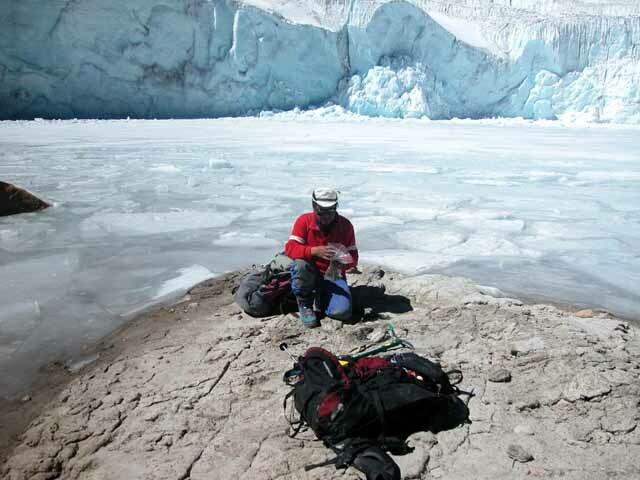 The "climate optimum" of about 4,000 to 8,000 years ago corresponds to the moss under the Quelccaya ice caps. The "Little Ice Age" happened in medieval times; it came on shortly after the series of storms that redrew the map of the Netherlands. The whole of the previous graph is contained in the pinhead of pixels at the far right edge of the graph. Here's a still longer view. The second graphic is squeezed into the pink bar and what's beyond it at the far right end of this one. Here you can see the whole of the last Ice Age. So it looks like we live in one of the warmest ages in global history, right? Now step all the way back. This very rough graph plots the likely temperature through geological time. Time flows the other way in this one (sorry; I couldn't find a graph that was consistent with the others). The present is way over on the left here. The distant past is on the right. And it's distant indeed: about the time life first was recorded on earth. Looks like we're in one of the chilliest epochs of world history. But it suits us. And any change in it -- toward the hot or the cold, by human agency or natural forces -- would be a disaster. Why were there Ice Ages after millions of years without them? Why were there dramatic warm spikes in the middle of them? Why has world climate been relatively stable for the past 4,000 years? Nobody knows. No good scientific model of world climate change yet has been constructed. That's a scary thought. No wonder it's so much easier to approach the topic as pure politics. Human beings right now have much invested in the stability of weather patterns and coastlines, and we ought to pay careful attention to what can cause catastrophic climate changes. Better to investigate and learn and adopt, rather than shut down discussion in advance because you don't like the people who want to hijack the issue and pour their personal manias into it. 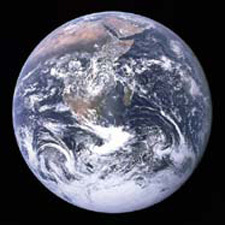 Environmentalists often share with creationists the unscientific view that at the creation a perfect world was set spinning. They presume a steady, stable world ecology humming along for millennia in perfect balance like a Swiss watch, until evil Anglo-American corporations come along and vandalize it. 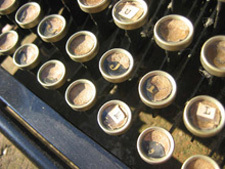 They write as though it all would continue in ecological harmony if only man would leave it alone. Like creationists, they view the human race as something non-natural, though in their case it seems to be sub-, not supra-, naturam, and its impact is entirely baleful. It's a common complaint of the secular left that their opponents put dogma above science. But the underlying fallacy of much of the climate-change alarmist rhetoric is that it is the left's equivalent of creationism. What we need now is serious scientific work, not a pseudo-religion. The boys who sit on the hills gazing out at the heavens take one path into science, and it's different from the path taken by the boys who clamber into caves and come home muddy at dark. She could heft 4 million pounds into space and fly 17,000 mph and pass unscathed through a blast furnace that would pulverize a solid block of concrete and melt battlefield armor. Those people were six times more distant from ancient Mycenae than ancient Mycenae is from us. And we live yet within the echo of their voices. "I've been offered several million dollars by developers. But I'm almost 80; what good's that money going to do me?" "Das Deutsche Wörterbuch von Jacob und Wilhelm Grimm"
© April 22, 2007 Douglas Harper Moe: "Say, what's a good word for scrutiny?" Shemp: "uh ... SCRUTINY!"